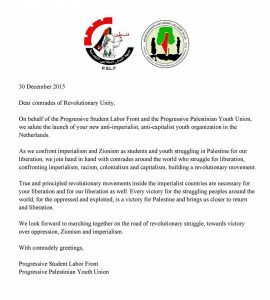 On behalf of the Progressive Student Labor Front and the Progressive Palestinian Youth Union, we salute the launch of your new anti-imperialist, anti-capitalist youth organization in the Netherlands. As we confront imperialism and Zionism as students and struggling Palestine for our liberation, we join hand in hand with comrades around the world who struggle for liberation, confronting imperialism, racism, colonialism, and capitalism, building a revolutionary movement. True and principled revolutionary movements inside the imperialist countries are necessary for you liberation and for our liberation as well. Every victory for the struggling people around the world, for the oppressed and exploited, is a victory for Palestine and brings us closer to return and liberation. We look forward to marching together on the road of revolutionary struggle, towards victory over oppression, Zionism and imperialism.